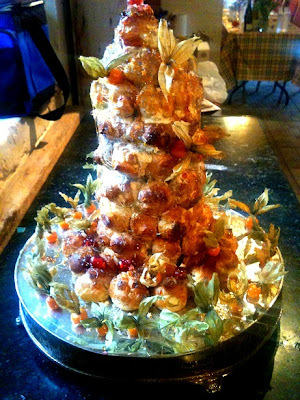 Croquembouche - sure! I'll try that. 3 generations celebrating how many 4 or 5 birthdays? Granny had asked for croquembouche. Whatever Granny wants Granny gets! Oh - you can't see the spun sugar on the iphone photo. Had fun making it though! 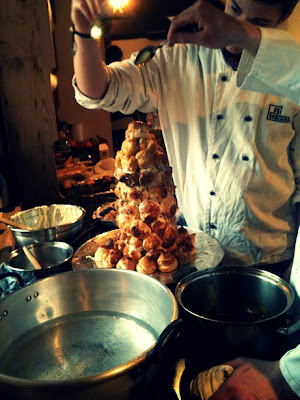 Although I enjoy making choux pastry and have made profiteroles, the idea of making a whole croquembouche has always terrified me. This one looks very impressive though! Terrified me too - until someone asked for it. And wanted to pay for it! I find this is a great motivator. Get one of your family to ask for it for a birthday/ Christmas! Great fun to make. We stuck the profiteroles with white chocolate - safer than caramel because you can chill in the fridge at various points to make it stick together. You have to be careful with the caramel version due to humidity & room temperature otherwise it can collapse. Also the cream in the profiteroles can go off if done too early on a summers day - you hear of wedding nightmares like this. 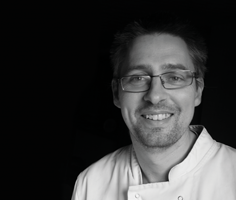 I knew one pastry chef that started at 4am on the day of his own wedding to make his own croquembouche - couldn't trust anyone else! Meh - take a deep breath and just go for it! Just found your comment - been too busy to function. Actually we did have a leaning tower of Pisa moment - we both had to catch it and someone else patched it back up, then we got it in the fridge to harden up quickly - the good thing about using chocolate! All fun!